Making chocolate chip cookies is easy, and many recipes exist for this Ultimate of Snacks. Mine is a bit more “adult,” especially if you’re able to find similar ingredients. Darker, more molasses-y brown sugar offers a more deep, almost anise-like flavor (without being too much like licorice, though). Try to nab bittersweet chocolate chips, or a chocolate with a high cocoa content, but less sugar than semi-sweet chocolate. Alternatively, you can chop up your own chips from your favorite bars —although that could yield a lot of unevenly sized bits, which might be an issue if you’re texture-picky. 😉 I also added orange zest and orange juice, for citrusy aromatic goodness. Homemade cookies are best, because the vast majority of commercial vendors cannot make them properly. Too mushy and pallid from being underbaked. (Just what the is this trend for undercooking cookies? To be more like cookie dough? Ugh! I don’t hanker for cookie dough, nor do I comprehend the silly cookie dough in ice cream thing. But for a real cookie? Bake the poor thing, will ya?) Or, on some occasions, sapphire-hard cookies from people who think that more crisp the better. Ouch. Then there are flavor issues. Astringent from too much baking soda or baking powders, ‘coz the puffier the better, right? Not at the cost of making the snacker’s face pucker up in disgust rather than desire, please. Too nutty: Alas, I just don’t like nuts in most cookies or cakes. Too plastic: Use the tastiest, smoothest chocolate, if you can find it. 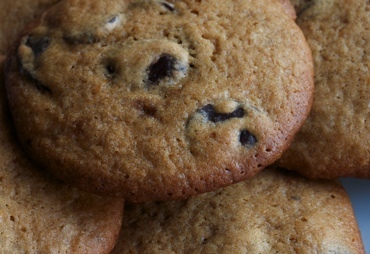 Avoid palm and coconut oils, their flavors don’t belong anywhere near a chocolate chip cookie. Avoid additives and preservatives. I mean, they are cookies, why should they have a prolonged lifetime? To eat after a decade? Er, no. Enough ranting, time to bake! 1/2 cup (4 ounces) sugar, white or organic granulated. I use half vanilla sugar and half unflavored sugar. If you don’t have vanilla sugar, add 2 teaspoons vanilla extract instead. 1/2 cup (4 ounces) darkest brown sugar you can find; Billington’s makes an excellent dark brown molasses (Muscovado) sugar (available at my local Whole Foods). 3/4 teaspoon salt; omit if using salted butter. 1 3/4 cups flour; I use unbleached white pastry flour, but all-purpose is fine. 8 ounces chocolate chips, preferably bittersweet; Dagoba Chocodrops are really good, containing 73% cocoa (again, available at some Whole Foods). Cream the butter, sugars (and vanilla extract, if using), salt and orange zest. Stir the baking powder into the flour, then alternate between adding these dry ingredients and the orange juice into the creamed mixture. Start out with 1/4 cup of orange juice, and add more if the dough seems too dry or crumbly. Scrape the sides of the bowl and mix well after each addition. Using a pair of dessert spoons, drop heaping tablespoonfuls of the dough onto baking sheet, spacing each cookie about 1 to 2 inches apart. Using a silicone baking mat on the sheet helps greatly with providing a non-stick surface as well as browning. Bake for 13 to 18 minutes, depending on your crispness preference. I prefer to wait until the edges start to brown, at least. Makes 24 to 30 cookies. Inhale while warm (or at room temperature, if patient, ha). With or without milk, tea, coffee, or ice cream. This was written by sairuh. Posted on Sunday, December 2, 2007, at 2:33 pm. Filed under Food. Tagged chocolate, cookies, oranges, recipe. Bookmark the permalink. Follow comments here with the RSS feed. Post a comment or leave a trackback.